What was your ISO because the image is rather noisy. Changing the warmth of the image might help remove some because right now the image is really cold in color. I really like the shades of blue in this photo, I just wish that the focus was adjusted a little better. Overall great work! Really like that the hot air balloons were incorporated in the image. Really adds contrast against the clouds in the photograph. Great job! Very cool image! It looks like the blue color curve was adjusted a little high because even the whites in the balloons have turned blue. But I like it either way. This is a very unique image in the gallery. Hope you had fun in Albuquerque! – The blue in this photo really stands out, perhaps a little bit too much. – The balloons add a nice sense of depth into the photo. – I would suggest cropping out some of the trees and focus mostly towards the sky as it is a little bit distracting. Nice clouds and how cool that you could capture an image with all those hot air balloons. They definitely add an interesting element to the photo. I do personally think the image would be improved if the blue color cast were removed through editing, however. 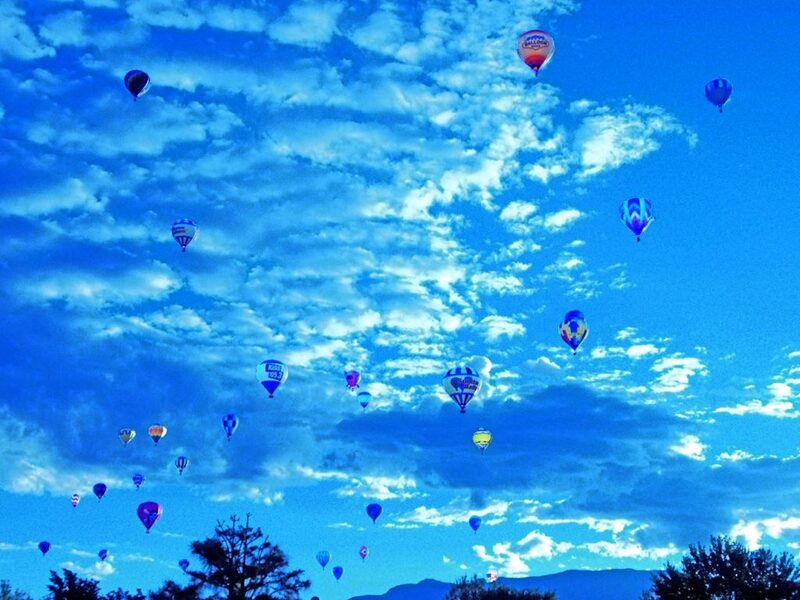 The Balloon Fiesta is an awesome experience, and you do a good job capturing the beauty of the fiesta and the clouds. It may have a little to much blue for my taste, but it is still a cool image. Maybe too much blue was used in the post processing. I like the contrast between the hot air balloons and the clouds. Great photo. Great photo with the hot air balloons at different heights. I like their is different weight in this image. The only distracting pact to me is the tree tops, and I would suggest removing them without cropping the bottom. Wonderful picture of white clouds with balloon! Very dynamic shot with the hot air balloons in the foreground. It seems very blue though, I think it would look really nice with more contrasting and brighter colors from the balloons. Very beautiful photo though! Art: I really like the color contrast with the sky and clouds against the various colors of the balloons. Photographic technique: The focus of the Clouds and balloons is great, the depth of field used was able to capture everything from the balloons to the clouds. The dispersed balloons make this picture. It looks a little too blue in my opinion but the cloud formations are beautiful. Great focus as well. Nice blue tint. Great detail in the clouds. Awesome focus. I like this picture. The range of the clouds is quite nice, the balloons are a nice feature of the photo, they nicely frame the clouds. Nice clear photo. The blue is very intense and it adds a nice backdrop to the foreground of balloons rising. Sharp focus! I feel like the blue hues of the photo are distracting. It gives a kind of funny look to the balloons. Otherwise, the photo is pretty cool. The colors on this are a little too extreme for me, although I can certainly appreciate the effect you were going for. Much like some of the other blue-ed out images, the colors give a surreal dream-like effect. The blue shift almost removed some of the detail in the clouds even though the focus was very sharp. The balloons really make this photo unique, and very interesting. Excellent contrast with the striking blues in this image. Possibly consider cropping out the trees on the bottom in the future, it distracts a bit from the rest of the image. The balloons add nicely to the image and are well focused upon. A great picture overall! Love the balloons in front of the crisp clouds and blue sky. Cloud detail looks really nice and balloons really make this image stand out. Really cool how the image portrays the could and the balloons without conflicting each other at all. The balloons give a nice visual to look at in comparison with the almost balloon like clouds above. Really cool! The image is a little blue, which makes it feel a little less happy than it could be, if that makes sense. Maybe a color adjustment would fix that. The clouds are really interesting. It’s nice that you can see where they are headed. The subjects and composition are quite amazing. I am concerned about the post processing and blue tone, I assume it was a intense lighting scenario, whit makes it difficult to capture a properly exposed image.